Merry Christmas everyone! I hope all of you who celebrate had an amazing time with your family and friends. Last night Chase and I went over to my parents house for our big Christmas Eve celebration. Growing up our family always had our celebration on Christmas Eve, where my parents would make a big homemade dinner and we would open presents together. I'm so glad we've kept the same European tradition. Today, we spent time with Chases family and I got to open a few more gifts in the morning. We had our 2nd Christmas dinner and ended the night with a movie! How did everyone's Christmas celebration go? For all you ladies in colder climates, I had the perfect winter coat to share with you all, until it recently sold out! I'm so upset because it was on sale and Chase got it for me for my birthday for under $200. Unfortunately, I haven't been able to find it anywhere online. Luckily, I found a few similar ones and have linked them all below. If it comes back in stock I will definitely let you ladies know! 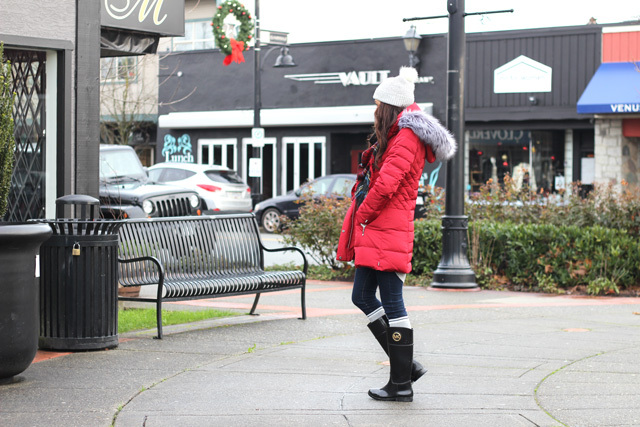 I wore this look to the Christmas parade a few weeks back and it kept me so warm that I was able to enjoy the parade. It rained that day, so I brought out my Micheal Kors rain boots to keep me nice and dry. I bought these boots last season and have to say that I'm super impressed with the quality and how comfortable they are. To finish off this look I added a pair of dark denim, a plaid scarf (my favourite for the season), a grey sweater, a grey and white pom pom beanie, and a textured pair of grey knee high socks with white and blue stripes. Thanks so much for stopping by everyone. Wishing you all a Merry Christmas and a Happy New Year to you and your family! I love this, so pretty! Especially love the boots. I really enjoy your blog. Maybe we can support eachother on Bloglovin'? Only if you like my blog too, ofcourse :) I've already started following yours cause its amazing! Thank you! And yes definitely:-) I've followed u on Bloglovin! We had a family day on Christmas Day, with the in-laws, my family and some uncles and aunts. Full house and lots of food, and will enjoy a quite day with probably a lot more food and some family friends today. Everything was very relaxed so far! Sounds like you all had a wonderful Christmas. This is the perfect outfit for this time of year. The red and plaid feel so festive. Looks like a great coat! Thanks so much Ela! Yes, definitely:-). Hope u had an awesome xmas as well! I love your outfit. Your red coat is fantastic. I love how you styled it with the plaid scarf and grey sweater. I'm glad you had a nice Christmas. I celebrated with my husband's family on Christmas Eve and with my family on Christmas. Have a wonderful weekend! Love the red coat! The fuzzy hood looks so cosy :) Great post! It sounds like you had a lovely Christmas with your family. That coat looks super warm and chic -- such a bummer that it's sold out. Thanks Vanessa! Yes, it was definitely nice to have everyone together as it doesn't happen very often:-). Hope ur xmas was just as good! I love how this outfit looks relaxed yet still really stylish, love the boots and vibrant coat especially! Merry Christmas Ela! It sounds like you had a beautiful celebration with your family. It's always so important to keep the traditions alive. 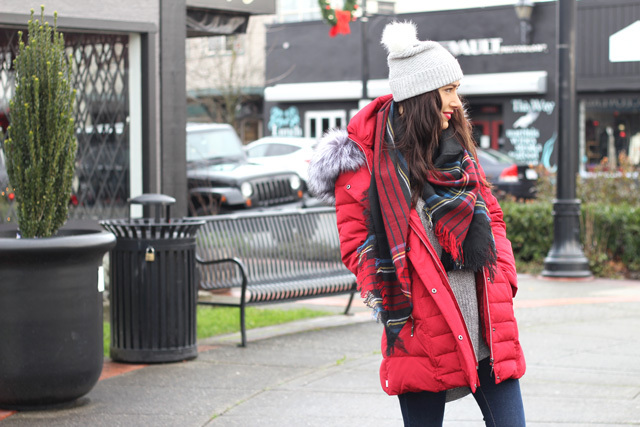 You look so beautifully cozy in this bundled up look! The red coat really makes the outfit! 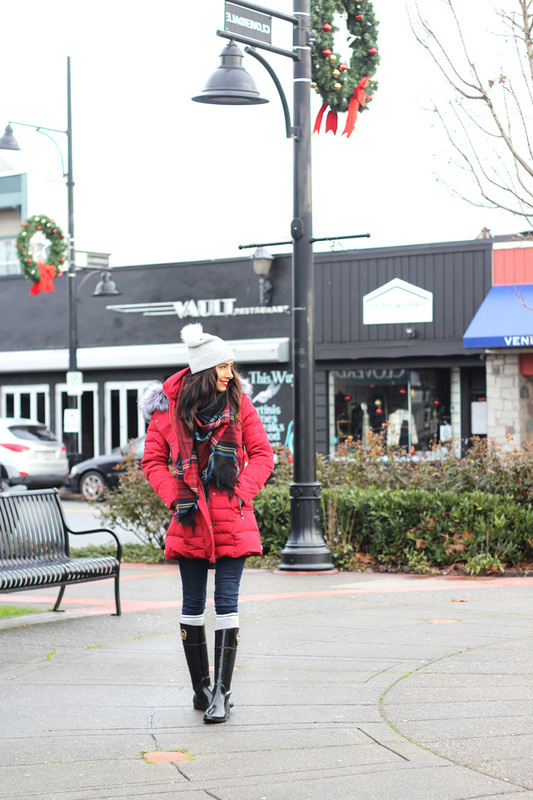 My brother actually got me a red puffer coat for Christmas and I can't wait to wear it! What a perfect, cozy winter outfit. Love the plaid scarf. Happy Holidays Ela! Love the coat. My Christmas went a lot like yours. Lots of food and a movie haha. Perfect winter outfit! I'm a tad bit jealous, simply because I'm supposed to wear outfits like this right not BUT rather it being the normal 40 degrees, it's in the high 70s so I'm not able to fully enjoy winter right now :( . I do love your scarf too by the way. How Fun! I'm glad you had a wonderful time surrounded by your loved ones. Love that coat, the entire look is perfect! Thank you so much Raysa! Hope ur Christmas and New Years was just as great:-) Wishing you all the best for 2016! Red is totally your color gorgeous:) Sending you so much love and this look is just perfect on you! I hope you are enjoying your holidays! Thank you so much Janna! Hahaha that's exactly why I wanted a coloured one. So much more fun to wear and you can definitely get a lot more creative with it. Hope u had a lovely New Years and wishing u all the best for 2016! This coat looks GORGEOUS on you! What a perfect outfit for Christmas! So sad it's over! 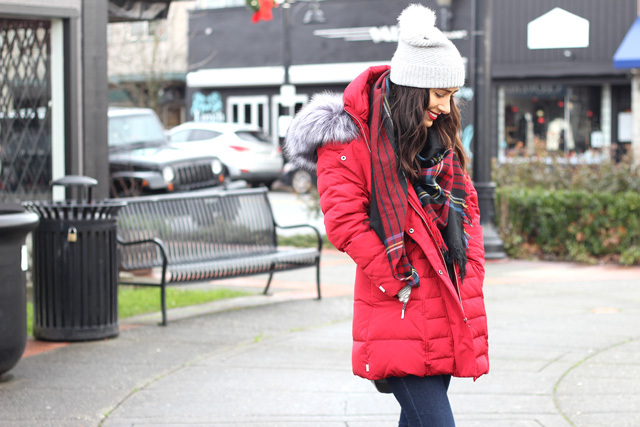 Loving your bright and cozy coat. That scarf matches it perfectly and your hat is so cute. Hope you have a wonderful last few days of 2015! 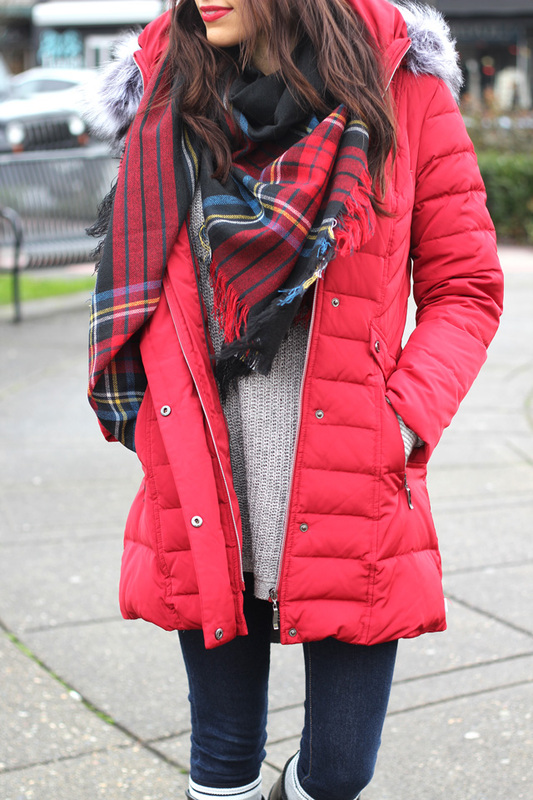 This coat is so lovely; I love everything about it, the red is the perfect shade! 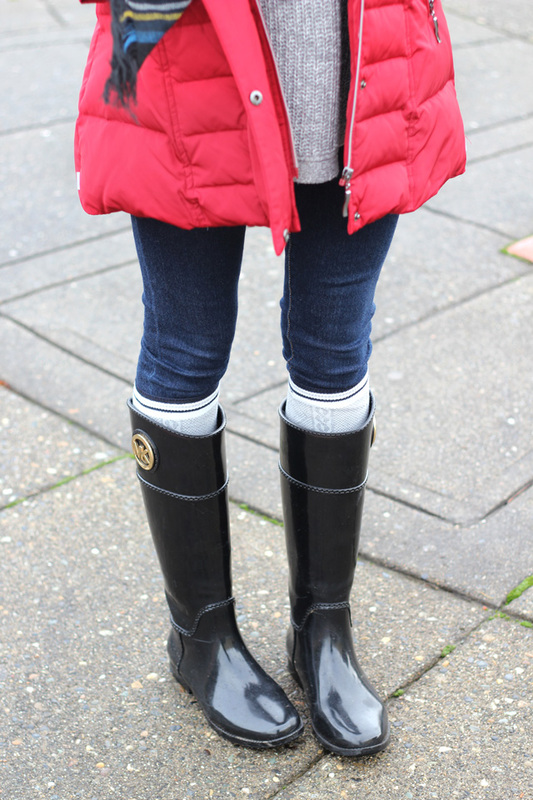 I'm also loving those MK rain boots, I need to get a pair, as I don't have any black. I hope you had a very Merry Christmas, beautiful, and thanks so much for sharing yet another inspirational look! Thank you so much Jalisa! I'm so glad I ended up going with a red rain jacket since I have so many black jackets. So glad you like the look and wishing you all the best for 2016! Thank you for all the love and support:-). Oooh I have been looking for a jacket for the longest time and I love the red color of this one!! Thanks for sharing! Wonderful outfit,it looks so warm and cozy!! Oooooh! I love that coat so much!! Red coats are like kryptonite for me haha. And your boots look fantastic. Glad to hear you had a wonderful Christmas, Ela! Such a perfect winter, and festive look. I love the red jacket on you! I'm glad you had a wonderful Christmas, and wishing you a happy New Years. Girrrlll you are so darn pretty!! 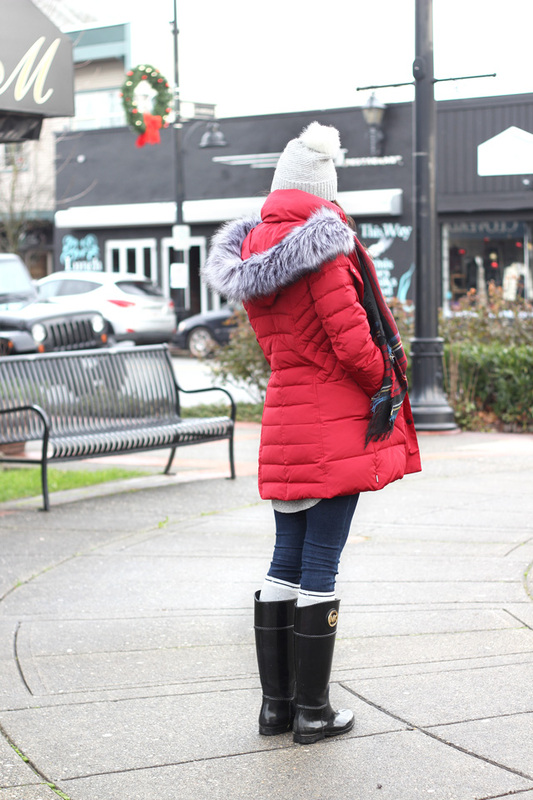 I am loving this super cosy red coat- it's always nice when our boyfriends treat us to something extra special :) You always look so cute in the pom pom beanies- you are inspiring me to wear them when I go to England next week! Your Christmas sounds like it was really lovely- it's great that you got to spend time with both your family and Chase's. I spent it with Jake's family as my family live in the UK. But they are throwing me a late Christmas when I go back! Thanks Rachel! Yes, definitely and especially when you get to pick it out yourself lol. That's so exciting that ur going to England! I can't wait to see all ur photos on instagram and follow along on ur journey. A pom pom beanie will look so good on u and can't wait to see u rock them! Hope u had a lovely New Year and wishing u the best for 2016!! Really lovely coat... what a lucky lady. Comfy and stylish!! Loving the boots! Thank u Dora! The boots were definitely a great purchase and would't hesitate buying another pair in a different colour soon :-). Hope u had a lovely New Years and wishing u the best for 2016! This look is so cool! Love the boots! I love red for the winter, because of its contrast against the snow where we live! So this coat is perfect! You look so cute Ela! Love your beanie and scarf too! Love this look! Love your coat and scarf!!! So pretty!!! Have an excellent New Years!!!! I love everything about this look! Seriously I'm so glad you got this coat because every time I see it, I want it!